I spent the last few days traveling up and down the Hudson Valley and taking in the best it had to offer. It was an exhausting work-related trip that left me tired but with some great souvenirs. 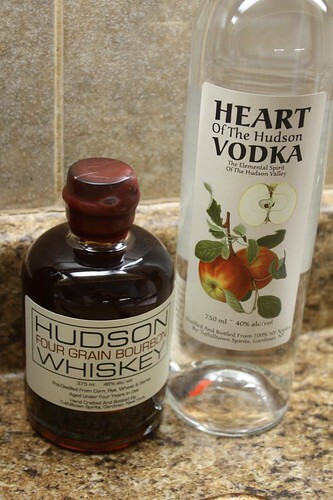 I visited Tuthilltown Distillery and came back with these two gems: the Four-Grain Bourbon, and the Heart of the Hudson vodka. It was a pretty awesome operation. We totally don't need more miscellaneous booze in our cupboard but it's impossible for me to not support a cool artisinal place that gives me a tour. We didn't have any Bourbon so that, arguably, fills a need. We have plenty of vodka including Divine Vodka that we purchased last summer in Michigan that is distilled from grapes from their vineyard. I have yet to open it. I placed the Heart of the Hudson (distilled from New York apples) next to the Divine. I can't wait to see what type of special vodka will be joining them next summer! After returning home I made myself lunch from the leftover odds and ends in the fridge. 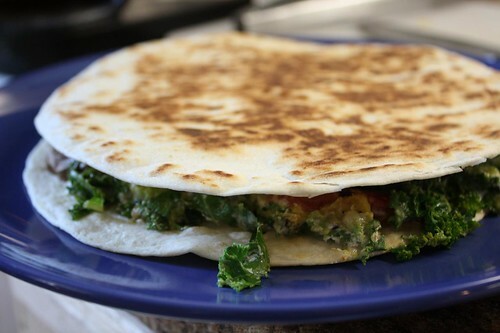 This included the paprika roasted potatoes from the other night, kale, avocado, tomato, a little cheddar and goat cheese, and some sour cream with fresh cilantro. The fridge clean out is going great in the lead up to our trip. Now it's just a matter of purchasing just enough food to keep us alive in the meantime without having any leftovers left in the fridge. It's also a great way to lose weight!